All our Granite worktops are cut and manufactured in our own dedicated and bespoke manufacturing facility using the latest Computer Numerical Controlled machinery (CNC), which ensures precise and accurate cutting of the granite for perfect work surface installation. 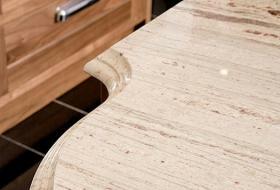 With over 25 years experience in the stone industry you can rest assured that you are in the hands of experts. At Interiors by Tony P we provide a full template and fitting service, we ensure all our work meets the highest quality standards. Before the granite worktops can be manufactured and installed a site survey has to be carried out which is called templating. This involves making exact replica of the required granite worktops, taking accurate measurements of the kitchen units and final locations of sinks, hobs, taps or any other fittings required which all need to be available on site. This is then used to manufacture the granite work tops ensuring a precise and accurate cutting of the granite for a perfect work surface installation. Granite sink / hob cut outs are barred front & back (fitting of steel support bars to give additional support to cutouts), Without steel supports bars, the length of a cut out is reduced considerably. Large cut outs need to be scored and cored on occasions. This leaves the corners of the cutout in place, ready for removal on-site by the installer. 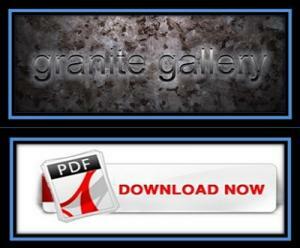 Granite is susceptible to 'blowing out'. This occurs when contact is made with the material whilst cutting or grinding. 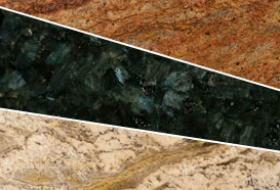 This is very common in large particled granite. ie. we fill and seal the affected areas with epoxy resin (colour may vary) to ensure the material is not left with any sharp edges or 'chips'. 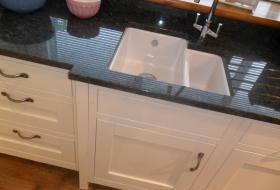 Sink cutouts are placed 50mm from the worktop front edge. 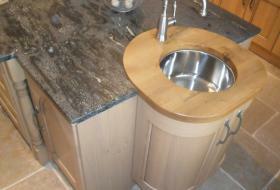 Granite is highly scratch resistant but not scratch proof. Small scratches of less than 25mm in length are considered 'within tolerance' and are considered acceptable. 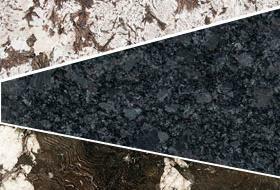 Although Granite is one of the least absorbent stone's, it can still be stained by grease, wine, coffee, nicotine, fruit juices and other strongly coloured substances. 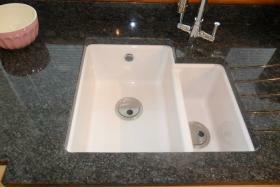 Granite worksurfaces are sealed upon installation and must be resealed every 6 months. Any spillages must be removed immediately as delay could result in permanent damage.